Hallelujah! | The Happy Wonderer ~ ellen b. 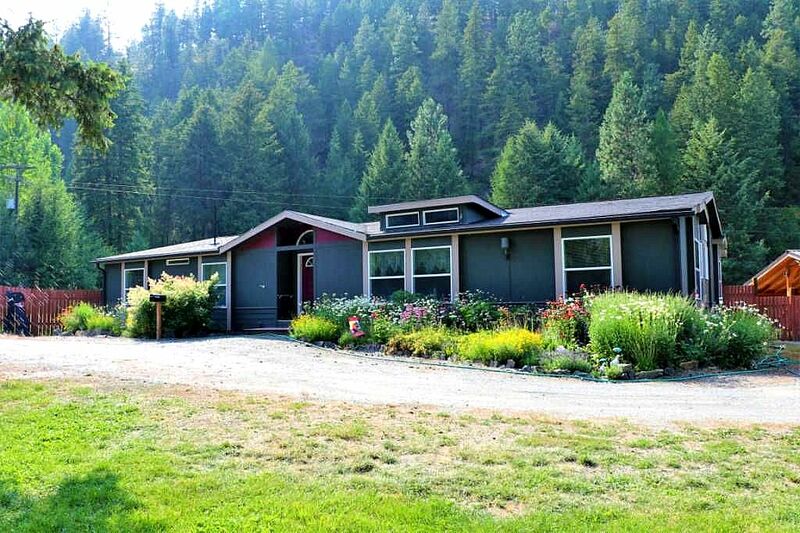 We are happy to announce that we are in contract for our new home in Colville, Washington. We will take possession on September 20th. Once it is ours you will see many more photos. We are so thankful and so relieved to know where all our stuff will land. We will be 8 miles from our Colville kids. The driveway is level and the home is all on one level which is good for our aging muscles. Thank you so much to all of you who have been praying and hoping with us. We appreciate all of you! Posted on August 22, 2018 by Ellen •	This entry was posted in Moving and tagged Colville. Bookmark the permalink. Very pleased for you. It looks lovely in such a green setting. It looks very nice in the sun! A lovely park-like setting! God Bless your new home! Glad we’ll be able to move in before the first snow! Thank you! It looks so pretty with the woods behind and I love those flower filled beds in front. Look forward to seeing more pictures as you move in and make this house your home sweet home. I sure hope I can keep the lovely plants alive! Thank you! Come before it snows, Vera! Hooraaay!! So Happy for you! Prayed you’d find a house soon! Seems like you’ve been looking for quite a while! Been following your blog for sometime now, but haven’t commented until now. I really enjoy it! We have one little grandson just a couple months younger than your granddaughter and another grandson who will be 10 months old the end of the month, so I especiallly enjoy your posts about your granddaughter! We waited a long time to become grandparents, so we are really enjoying them and are so very fortunate they both live close by! Nice to meet you here, Laura. Thanks for your comment and your prayers! Oh Ellen – it looks beautiful and it found you!!!!! Your backyard view is stunning. So SO happy for you and can’t wait to see more pictures. September 20 can’t come soon enough! Yay…. Congratulations! Looks like a lovely home. YAY, congrats on the house. It looks pretty. Thanks Eileen! Looking forward to the birds and critters that might visit. I wish you could see me smiling, Ellen, so happy for you both. Lovely home just waiting for your treasures to fill its rooms. Sue, I appreciate those smiles and good wishes! Oh that is great that you have finally found your new home. Nice to have one level. A pretty home in a pretty location with all those trees. So happy for you. Still no luck with us selling our house. Thank you and praying your home sells soon. Yay! It looks like a cute house. What fun you’ll have fixing it up with your own stuff and making it yours. It will be fun to rediscover all the things that are packed away! Thank you Lorrie! Oh, Ellen! Rejoicing indeed! Praise God for His infinite mercy and loving care on those who carry His name! SO very happy for this answer to prayer! Thank you Dianna for your prayers! Alycia, God is good indeed. Awesome! It looks beautiful. Thanks be to God! Jody, thank you and thanks be to God! WONDERFUL! How picturesque it is set against those majestic trees. Congratulations! It’s all easy sailing from here right? …right? Nice garden and the forest behind is so pretty! You’ll be cozy at home in no time just in time for fall colors. I used to be 8 miles from my grands….it was wonderful! Rejoicing with you! It looks like a wonderful home in a lovely setting. How wonderful that you’ll be moving in September! All the luck in the world in your new home, Ellen! Hallelujah, indeed! Wise to choose a home with all the essentials on one level, and what a blessing to be so close to family! Now that will be lovely especially with that little pond! Lovely flowers too!